The last eight owner-builders to complete their houses through Peoples’ Self-Help Housing’s home ownership development in San Miguel were celebrated in May. View more photos. Applications are still being accepted for adjacent self-help community, Mission Gardens in San Miguel. 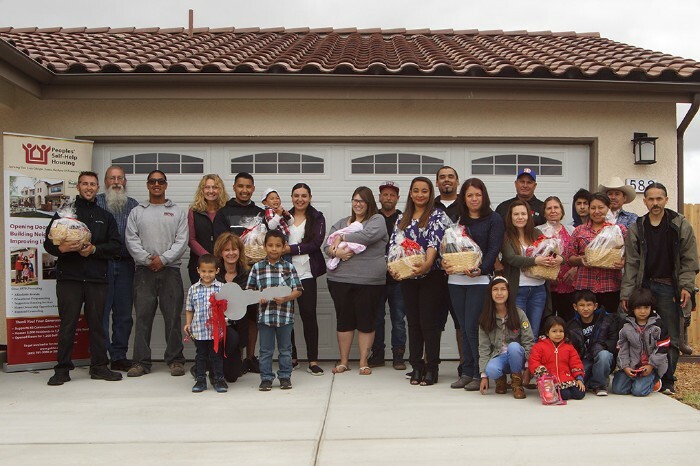 San Miguel, Calif., June 22, 2018 – House keys for the last eight owner-builders of Peoples’ Self-Help Housing’s (PSHH) most recent self-help development were handed out during a happy ceremony held at their new North San Luis Obispo County neighborhood on May 25. Since its founding in 1970, PSHH has helped nearly 1,200 low-income households on the Central Coast become homeowners. Ten groups work together under PSHH’s supervision to build one another’s houses. A group can consist of family members or friends, aged 16 or older, who complete nearly all the construction of a house with exception of the highly specialized work that is contracted to licensed professionals. With each group contributing approximately 2,000 hours of labor, this “sweat equity” reduces costs by 20-25% and acts as the down payment. During the process, PSHH also helps owner-builders learn about loan qualification and financing as well as proving support and counseling after the completion of their house. Construction and mortgage funding is provided through the Rural Housing Service of the U.S. Department of Agriculture. This most recent group is the last of three in the San Miguel subdivision located south of 11th Street. The first eight households completed and occupied their homes in the fall of 2017. PSHH is accepting applications for 14 more homes in the nearby Mission Gardens development, also in San Miguel. Applicants need to meet income requirements between $40,000 and $66,550 for a family of 4 or less or $87,850 for a household of 5 or more. Good credit and rental history are also required along with the ability to commit to working approximately 40 hours a week mostly on weekends on the construction of their home. Applicants must be a U.S. citizen or permanent resident. Details on the program are available at www.pshhc.org/housing/self-help-ownership or from the PSHH Office at 3533 Empleo Street, San Luis Obispo, CA 93401, Monday-Friday 8 am-5 pm. For more information, call (805) 540-2446 or email info@pshhc.org. Founded in 1970, PSHH is the largest nonprofit affordable housing developer on the Central Coast and has the mission of building affordable homes and providing site-based services that offer opportunities to change lives and strengthen communities. PSHH serves low-income working families, farmworkers, seniors and veterans and provides welcoming environments for those living with disabilities and the formerly homeless. Through its properties and offices, PSHH has a presence in San Luis Obispo, Santa Barbara and Ventura counties, manages over 1,800 rental units, and employs nearly 200 staff members. For more information on PSHH, visit www.pshhc.org, email info@pshhc.org or phone (805) 781-3088.